Police say they made the right decision to shoot a man who fired at officers during a 150km pursuit through the Bay of Plenty to the Coromandel town of Waihi. "The decision to shoot on the evidence we have before us appears to be justified," Detective Inspector Peter Devoy said yesterday. 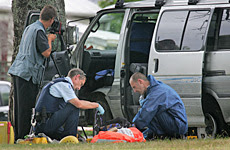 The 19-year-old man remained in a critical but stable condition in Waikato Hospital last night. Mr Devoy said he had undergone surgery for a single bullet wound to the torso fired by an armed offenders squad officer at the end of Monday's pursuit. Witnesses said the 19-year-old, who was the passenger in a stolen van allegedly driven by his 18-year-old girlfriend, emerged from the van pointing a rifle at police when the vehicle was forced off the road at Waihi. Mr Devoy yesterday revealed that the gun - a .22 calibre rifle - was loaded and the van was carrying explosives and ammunition. He said the armed offenders squad officer shot the 19-year-old after he fired shots with the rifle which struck two police cars during the pursuit and "immediately raised it into an aim position" when surrounded by officers in Waihi. The issue here is not that he shot at Police during the chase, the issue is did he aim the gun at Police when he surrendered, now Detective Inspector Peter Devoy says that happened, but then again he’s a cop, and that’s exactly what he would say, which is why it needs to be independently investigated and why we need an independent complaints authority. That said, where as questions of appropriate shooting tactics when confronted by a claw hammer or a baseball bat are valid, the reality is that if you are DUMB enough to not only have a loaded gun on you when being chased by cops, but allegedly pointing a gun at cops leaves you very little sympathy if they shoot you. What a dickhead of a 19 year old. Why an independant enquiery to waste our hard earned tax dollars. This looser is blody lucky the cops didnt shoot to kill the drug infested low life. anon... but they did shoot to kill the kid. He didn't die. Look the keystone cops could line a 100 people up on Queen Street and machine gun them down and the PCA would say it had conducted a extensive investigation and found no fault . RIP Stephen W and Stephen B !! I agree with MJ. Now we have to pay for this loser for years in terms of prison and the benefit. Good times. PS of course the police acted appropriately. lol I just wished some of the cops would being shot, it makes a better debate and some of them need to be sot at some stage. That way I am sure my taxes that pay there wage is also well spent. Rotten shots. You'd have thought they'd get enough bullets into the guy to kill him and offed the tart at the same time. They should get them some army training - don't stop shooting till they aren't moving! And that right there is a good example of why you shouldn't snort dish washing powder before using teh interwebs !!!1! I saw this video on efukt.com that really captures the way I feel about justice. If you do any kind of violent crime worse than assault and it is obvious that you were the one at fault (ie bleeding knuckles, carrying the bloodied knife etc) you should be executed in public on the spot. The brown community would quickly fall into line.